When two similar products are released with similar names you expect them to be, well, similar. 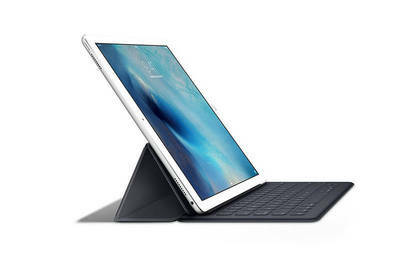 So when Apple announced the iPad Pro, a souped-up tablet with a folding keyboard cover and a stylus, it was hard not to compare it to Microsoft’s Surface Pro, another souped-up tablet with a folding keyboard cover and a stylus. The iPad Pro is a beautiful tablet with an impressive, 12.9” screen and the guts to go with it. Its A9X processor can handle complex tasks, including video-editing 4K (UHD) video and rendering graphics at high speed. The Apple Pencil stylus is wonderful to use and its conical tip (rather than a single point) means when using it to draw, you can tilt and shade like a real pencil. The latency of the line being drawn was barely noticeable. The pencil charges by removing the cap of its “eraser” end to reveal a Lightning plug. This means the pencil can be plugged in either directly into the iPad’s base or into a regular Lightning USB charging cable using an adapter supplied with the pencil. It’s handy the pencil doesn’t often need charging. Annoyingly, the iPad has no magnetic dock or slot for carrying the pencil. The folding Smart Keyboard cover makes for a good keyboard but a poor cover. Due to the strange folding mechanism, it adds a lot to the Pro’s thickness and weight. You need the keyboard to prop the iPad upright, like a laptop. Both the pencil and the keyboard cover are sold as separate accessories. Without these, the iPad Pro is basically just a large iPad. All of this power would be amazing if there was a powerful app to use it on. The iPad Pro’s biggest constraint is the iOS operating system. While the iPad Pro could be a great tool for design, there are only simplistic versions of the more complex design and editing programs, such as Photoshop, available in the App Store. On the flipside is the Microsoft Surface Pro 4. While slightly heftier than the iPad, the Surface runs a full version of Windows 10 and is an impressive tool. The Surface comes with a pen that has a pressure-sensitive tip and a clickable “eraser”, which can quickly open OneNote or take a screenshot. There was negligible lag when writing with the pen, though pressure sensitivity can be hard to gauge. The Type Cover keyboard is sold separately and is fairly thick with raised keys. Its double hinge allows the keyboard to be set at a slope for easier typing. This makes the keyboard bounce as you type, which can be annoying for those who type with heavy fingers. The Surface has a fully adjustable kickstand on the back, which means it can stand on its own without the keyboard. As the Surface runs Windows 10, you can download and run any application you would on a Windows machine. 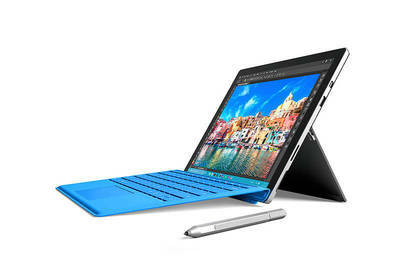 The Surface can easily run hardware-intensive programs such as Photoshop and video-editing software. Given the differences, the comparison between the two seems unfair. The Surface is closer to the MacBook Pro than the iPad Pro; a very good laptop rather than just a powerful tablet. If you are looking for something with the abilities of a laptop but the size of a tablet, then go for the Surface, if you just want a more powerful tablet, then it’s the iPad Pro. Our writer received these tablets on loan for this First Look. First Looks are trials of new or interesting products from the perspective of our product experts. Our lab-based tests offer truly objective product comparisons.